Almost everyone can run, but few adults run biomechanically efficiently. There is a lot of motion to manage to run biomechanically correct. One of the simplest but most important motions of running is arm swing, you know, one arm moving in one direction while the opposite leg moves in the other, providing locomotion. But most runners’ arm swing moves across the front of their bodies, at least somewhat. This across-the-body arm swing doesn’t necessarily look wrong or feel bad. But physics being what they are, each time our arms move across our body, our body twists with it. So, while we think we’re using are arms to run straight in a forward direction, we’re creating a twisting, side-to-side force. And to offset that, we have to use other muscles and more energy. 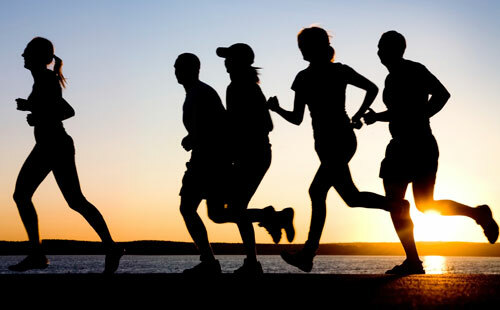 The result is that we run slower and expend more energy, which likely impacts how far or long we can run. It is inefficient. And not only does it negatively impact qualitative results (time and distance or duration), it makes the activity less enjoyable, satisfying, and fulfilling. Put simply – less fun. The fix (and how can we not want to fix it)? From an upright posture with our shoulders back (not “up”), let our arms hang down from our shoulders, and swing them alongside our body parallel to the direction we are running. This aligns our arms and leg stride in line with the direction we are running. This proper alignment enables us to run faster, or further, or both, and an added bonus, it reduces the threat of injury. But perhaps more valuable is the good feeling, the joy, the satisfaction that comes from running free, and easy, harmoniously with good tempo, synchronized, with maximum productivity and minimal effort. Put simply, from running as well as we can run. When our business is misaligned, it is not synchronized or synergistic. It is inefficient. It is more laborious and less productive than it could be. And it is less enjoyable, satisfying, and fulfilling. When our business is aligned, from exit strategy, vision, mission, and values, to strategic objectives, position, value proposition, competitive advantage, organizational design, and processes, we increase synchronicity, synergy, and productivity – with each part optimized and making the other parts better. We can more efficiently and consistently achieve our quantitative desired results, some combination of revenue, profit, market share, or other shareholder value. But perhaps more than that, our aligned, synchronized, synergized business brings us more joy, fulfillment, and satisfaction, moment to moment, day-to-day. This can be realized by all stakeholders. The “journey” can be as or more valuable than the results. And after all, when it’s all said and done, there is really nothing but the journey.